Here are a selection of suit carriers (or garment bags) for your one-off lifetime purchase from the Briggs & Riley ‘Baseline’ collection. The Classic Garment Cover is of a slim, lightweight design, making it the perfect alternative to bigger bags to use as a carry-on for short business or leisure trips by air, or to pop in the back of the car. It is constructed of durable ballistic nylon, will weather the toughest travel conditions and can accommodate 2-3 hanging garments. The black bag measures 57.2 x 62.2 x 5.1 cm and retails for £159. 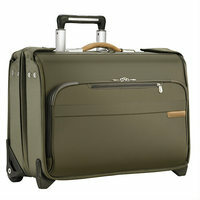 The Carry-on Wheeled Garment Bag carries hanging clothes in a protected structured case while avoiding having to check the bag in (and having to wait at the other end). The durable ballistic nylon outer fabric can withstand the toughest travel conditions (including over-zealous baggage handlers) and meets the carry-on regulations for most UK airlines**. The bag, which comes with two clothes hangers, is available in black or olive, measures 38.1 x 53.3 x 22.9 cm and retails for £449. Ideal for a 3-6 day trip, the Deluxe Wheeled Garment Bag is designed for easy packing and easy transportation. It features multiple compartments and pockets for all types of wardrobe items and comes with a removable shoulder strap, two hangers and a TSA lock. Available in black or olive, the bag measures 53.3 x 61.0 x 26.2 cm and retails for £539. The Wheeled Wardrobe is perfect for week-long trips; with plenty of space for hanging clothes and corner pockets for small items, just unzip, hang it up and you’re done! It accommodates 4-8 suits (or jackets, trousers and dresses) and comes with two hangers and a lock. The bag is black in colour, measures 58.4 x 61.0 x 32.5 cm and retails for £599. Briggs & Riley products are available online at johnlewis.com, at selected John Lewis Branches, Selfridges, London Luggage, Global Luggage and leading independent retailers (a full list can be found at briggs-riley.com/luggage-stores/international/).